Delivering a message to Ahab, King of Israel, was not a job for cowards. Especially when it was bad news! Elijah the Tishbite stood boldly before the one who provoked Israel’s God more than any king before him, and proclaimed: “As the LORD God of Israel lives, before whom I stand, there shall not be dew nor rain these years, except at my word” (1 Kings 17:1). Then he left. His first recorded commission complete, the prophet followed the word of the LORD’s direction, making his way to the Brook Cherith, some twenty-five or more miles from Samaria. Morning and evening, glossy-feathered ravens miraculously delivered bread and meat to satisfy his hunger, and water from the brook slaked his thirst. As the drought worsened, the vital stream dwindled to a trickle until finally its precious liquid vanished. The word of the LORD came again to Elijah: “Arise, go to Zarephath, which belongs to Sidon, and dwell there” (v.9). Elijah did not question his new instructions, but he must have considered their ramifications. This town, seven miles south of Sidon on the Mediterranean coast, was under the rule of a Baal-worshiping king, Ethbaal, who happened to be Ahab’s own father-in-law; and it was undoubtedly immersed in the heathen practices that Israel’s God loathed. 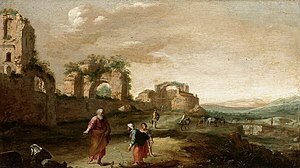 It took some time to travel to Zarephath, perhaps several days, and when he arrived, Elijah was thirsty and hungry. The LORD had already made provisions: “….I have commanded a widow woman there to provide for you” (v.9). Entering the city, he encountered the widow, just as promised. When he called to her with his astonishing request—water and bread in the midst of a punishing drought—she immediately set about tending to his needs. Some of the larger fresh streams possibly still flowed enough for her to fetch a little water, but having enough on hand to provide a “morsel of bread” was quite another matter. “As the LORD your God lives, I do not have bread, only a handful of flour in a bin, and a little oil in a jar,” she answered. “….See, I am gathering a couple of sticks that I may go in and prepare it for myself and my son, that we may eat it, and die” (v.12). Not so, Elijah countered. “’Do not fear; go and do as you have said, but make me a small cake from it first, and bring it to me; and afterward make some for yourself and your son. For thus says the LORD God of Israel: ‘The bin of flour shall not be used up, nor shall the jar of oil run dry, until the day the LORD sends rain on the earth’” (vv.13-14). Rejuvenated by these words of hope, the widow was quick to believe. She was not disappointed. Her bin of flour never ran out, and her jar of oil never went dry for as long as He withheld rain from the wicked land. What a testament to God’s power and mercy within the precincts of a city steeped in Baal worship—not only to His ability to sustain life, but to restore it! I feel certain there were two fewer idolaters in Zaraphath after that day, and that Elijah, the true prophet of God, was not without honor there, at least in eyes of this poor Gentile widow. Elijah was probably from Tishbe, thought to have been located 22 miles south of the Sea of Galilee, in the land allotted to Gad. (See http://en.wikipedia.org/wiki/Tishbite. Also http://www.bible-history.com/geography/ancient-israel/ot/tishbe.html.) This town was a substantial distance from Samaria where likely Ahab was when Elijah delivered his ominous message. The Bible does not furnish the location of this exchange. 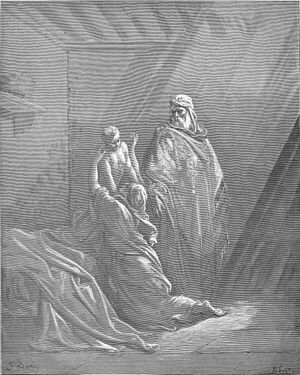 Perhaps it occurred in Samaria at Ahab’s royal palace. Some have suggested the word “ravens” be translated “Arabians,” made possible by altering the vowel points of the Hebrew word. Others posit that the original word stands for “merchants,” i.e., men from a nearby village who would come twice daily with Elijah’s food. Neither of these positions is provable, and so this author prefers to take the Bible at its word. These birds were miraculously sent by God to feed His prophet. Further discussion on this can be found in Elijah: His Life & Times, by W. Milligan, D.D. (James Nisbet and Co. London, publishers), p.23. The Women’s Study Bible, note “Widow of Zarephath,” p. 581. Some puzzle over the widow’s response. She trusted the prophet’s word during the famine, and their lives were spared. Why now was she ready to assume that this same Elijah was responsible for her son’s death? Had she committed some sin and feared this was a punishment sent from God, they wonder. After all, her culture was one of vengeance, and of worshipping a god that demanded human sacrifice. Or was it a matter of blaming someone else for a loss in an attempt to deflect from deep-seated feelings of personal guilt on some level?